This interface is similar to RS485 interface. The RS422 interface is used for multi drop configuration and supports up to 10 devices at a time. It is used in balanced differential mode. It supports data rate from 100 kbps to about 10 Mbps. 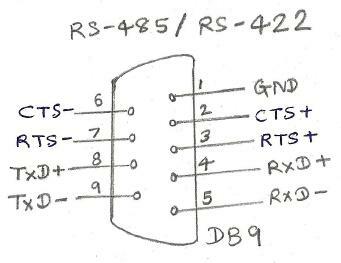 Figure depicts RS 422 pin configuration for 9 pin connector. Following table-1 describes RS422 technical specifications. Receiver Input Resistance 4K min.